Dear Sony, Thank you for having your console contain a library of varied game genres. This is why, in my opinion, the PlayStation 3 is better than the Xbox 360. For right now, my choices of next gen consoles will be my Wii U and PlayStation 4. 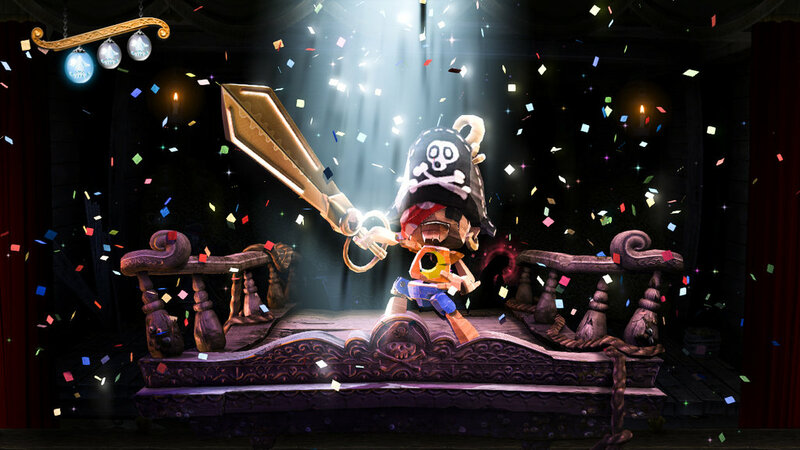 I chose those two consoles because they have more of the kind of games I like, and the game that helps prove my point in why having a varied library of exclusive games is a good thing is the PlayStation 3 platformer, Puppeteer. 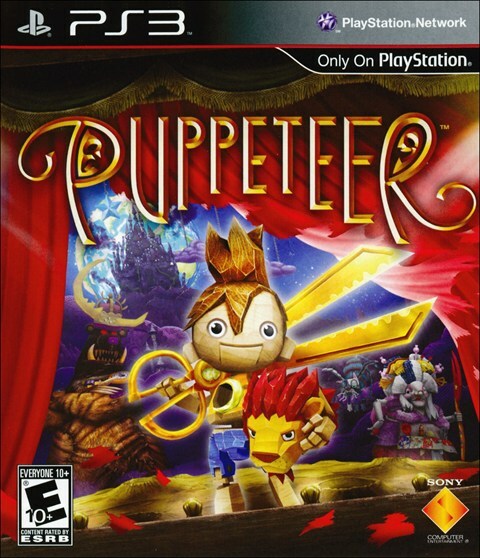 Made by Sony’s Japan studio, Puppeteer is one of the most creative and well-made platformers on the PlayStation 3, next to Little Big Planet. I don’t think I need to explain any more why this is a key example of a good game and a good exclusive, so let us move on to the game’s story! The story revolves around a young boy named Kutaro. He has been captured by an evil ruler of the moon, known as the Moon Bear King. The Moon Bear King (that is quite the mouthful of a name) turns Kutaro into a puppet, devours his head, and tosses him away. Kutaro then finds an ally with the witch who lives in the kitchen area of the castle where the Moon Bear King lives. You also find out that the reason why the Moon Bear King is the ruler is because he took control of a powerful crystal that the Moon Goddess had. After escaping the castle with a magical pair of scissors, Kutaro sets off on a journey to regain parts of the crystal that were taken by the antagonist’s generals. It is up to Kutaro to save the day, the souls of children kidnapped by the Moon Bear King, and, on top of saving the world, regain his own head. The story is light-hearted and entertaining. The voice work is top notch, the characters are memorable, and it can be pretty self-aware as far as plots go, since the characters will constantly break the fourth wall and talk to the audience and the player. It’s a fun story that any gamer, young or old, can enjoy. 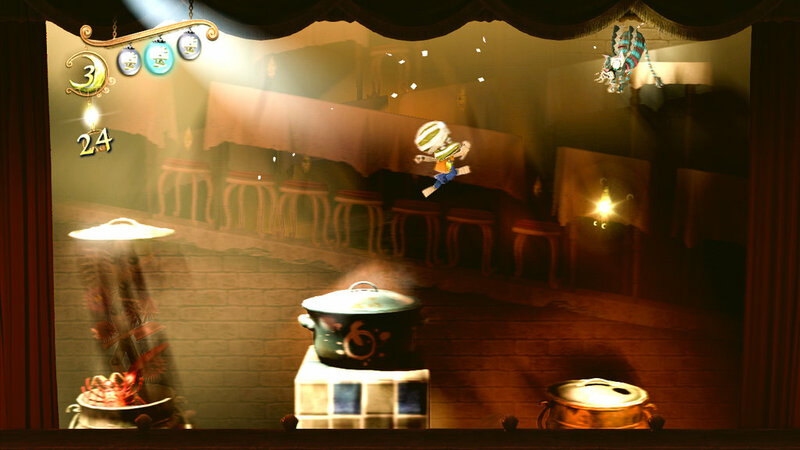 The gameplay is of a 2.5D side-scrolling platformer. You will be traveling up, down, left, and right all across the screen, dodging obstacles and fighting enemies with each level ending with a mini-boss or a major boss fight. Your main weapon of choice is a pair of giant scissors. You can use the scissors by cutting up enemies or helping you get across some of the more creative platforming. I will get to that in a second. You can use your scissors to attack enemies in four different directions. Obviously, that isn’t good enough, and you will need more ways to tackle the levels and enemies. Luckily, you can find the four heads of the legendary warriors to assist you in solving minor puzzles, helping you get across the levels, beating the bosses, and finding secrets. On top of all this, since your character has lost his head, he needs to find replacements until he can get his own head back. Each head you collect, besides being different, has a little ability that can either help you find a secret, or in some areas, give you an advantage over a mini-boss or obstacle that is in your way. Don’t lose your head though, if you can’t pick up one of your three heads after a few seconds, they are gone. You will lose a life if you lose all three heads. You will also be accompanied by a princess who can help you find secrets and help you in certain parts of the levels. 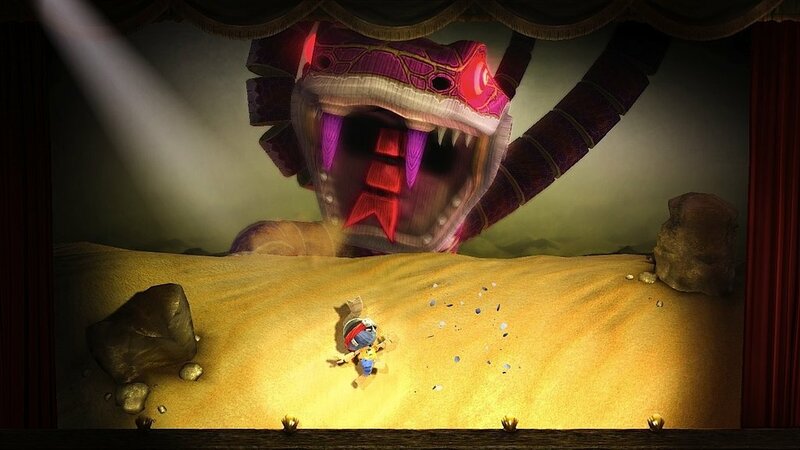 The game can be rather tricky, level-wise, and will throw different challenges your way. You can collect multiple heads, and each world has three levels that last around 30 minutes each. In my opinion, the levels don’t overstay their welcome and offer something new. It also helps that after obtaining the legendary heads, the levels end up with more replay value, and that is a good thing here, since a major complaint about games these days is that they can lack replay value. The levels are fun enough, though, that you will definitely want to replay through them again. The graphics and art style is just beautiful to look at. It definitely has a unique look to it, and as far as I know, doesn’t look like any other game that I have seen on the PlayStation 3. 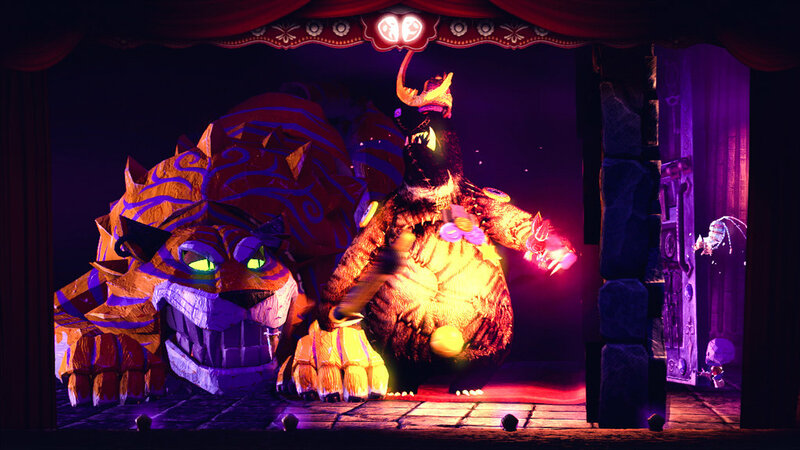 I did an article a few months back talking about Puppeteer, saying how it is a platformer for kids and adults, but the look is definitely more adult. It’s an interesting art style, and the whole faded paint look on everyone gives it a slightly creepy undertone. The game can look rather creepy at times, and while it doesn’t get to anything like Cry of Fear or look as grotesque as something in John Carpenter’s The Thing, it’s that feeling you get when you go into an old, dark, dingy storage attic and find old rusted and aged toys that have aged to the point that they look terrifying. The music is also very well done. It is composed by Patrick Doyle. He is mostly known for composing music for films like Sense and Sensibility, Rise of the Planet of the Apes, Thor, Hamlet, and Eragon. 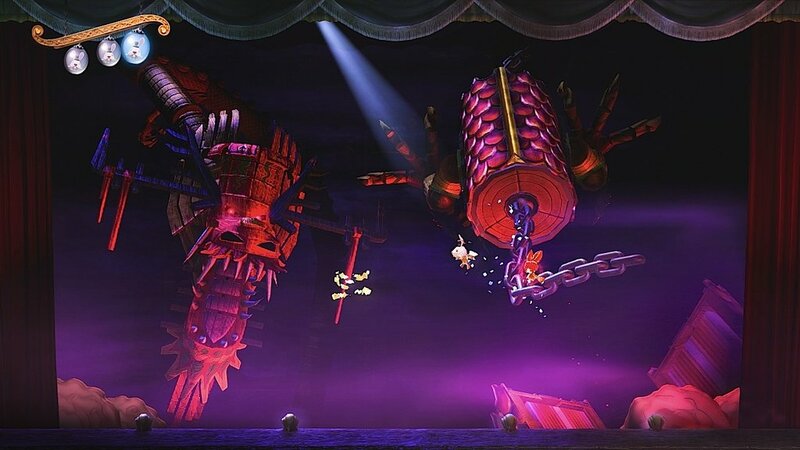 The music fits the levels perfectly, and it really gets you into the atmosphere of a puppet show. So, what is wrong with this puppet show? While I love the level design, some parts end up a little clunky and not fully polished out, but this issue only appeared like once or twice in every world. Some of the abilities you get are also kind of clunky, like the knight’s shield can only be pointed in four different directions, and it isn’t always the most fluent of abilities to use. I also feel like you use the three other heads more than the knight’s shield. Sure, the knight’s shield is used more in boss fights, but the pirate hook, ninja bomb, and wrestler ground pound are used more in the levels than the knight’s head. I also thought the game’s 3D capabilities are a mixed bag. I remember hearing about this feature and how they found a way to make the game run on 3D without the frame rate chugging at a snail’s pace. Luckily, the game doesn’t chug at a snail’s pace when the 3D is on, but the game’s 3D isn’t that amazing. When it works, it works, but you can play this game without losing anything by not playing in 3D. I guess a similar feeling is when you watch a movie like UP or any other film that isn’t originally filmed in 3D, and then watch a film like Avatar or Life of Pi, which was meant to be filmed in 3D. It is a bit underwhelming. In the end, this is a really good game. Sure, this year has a mountain of platformers that are just amazing, like Rayman Legends, and with Super Mario 3D World and Donkey Kong Country Tropical Freeze coming out in a few months, I think this game might have been buried under the more high profile platformers. Luckily, it is a good game, and at $40, I would highly recommend buying this game if you are a PlayStation 3 owner or a fan of platformers. This is definitely one puppet show that you shouldn’t miss out on.